Again, another quick dinner because I previously blanched and froze red potatoes! These herbed red potatoes are the perfect compliment to our Smoky Sweet Potato Bean Spinach Burgers and roasted zucchini and grape tomatoes! I simply took the bag of frozen potatoes out of the freezer this morning and stored it in the fridge until just before I needed to start cooking for dinner. 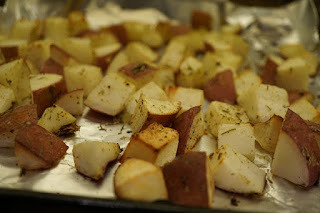 Then, I placed them on non-stick foil, added herbs, and roasted at 400 degrees F for about 25 minutes. I didn't have to chop any potatoes and they were partially done already! Batch cook and freeze! It will cut down on preparation time on week nights!